The PRED9X operates wirelessly: no wires to get in your way when hunting. You can operate the PRED9X without taking your hand away from the firing position using the wireless switch which has a range to five metres and can be attached to your scope or rifle with a convenient Velcro strip. High contrast light source allows you to spot camouflaged prey in heavy cover. The inbuilt shroud controls stray light producing a tight spot, giving you better range than regular LEDs. This allows you to see beyond 250 yards. The high CRI bulb reduces eye shine and aids in species definition when hunting. The PRED9X has an incomparable run time because of the use of low energy LEDs. There is a run time of two hours when at full power and ten hours when running on low beam and the batteries can be recharged on the run using the in car charger. The LEDs have a lifetime of 35,000 hours use. Moulded from high-tech polymers, the weight of the PRED9X is just 375 grams including on-board batteries (2 x type 2200mAh, Lithium Ion 18650). The compact dimensions give the PRED9X a vertical footprint with clearance for 56mm objective riflescopes. The light measures just 108mmx69mmx199mm from the top to the bottom of the clamp. A quick release mount makes it easy to take the PRED9X on and off your scope. The quick release mount is suitable for both Picatinny and Weaver rails. The scope mount ring fits 25mm, 1 inch and 30mm tubes. PRED9X is also available in with dedicated RED or GREEN LEDs. This compact lightweight LED weapons mounted LED light utilises a genuine CREE LED, the Color Rendering Index (CRI) has been specially chosen for its ability to produce a neutral white light resulting in superior target acquisition and colour definition. This enables the user to clearly distinguish objects in clarity without the glare often found in standard LED lights. Two fully charged batteries will provide 90 minutes of maximum light intensity. The unit can be operated using a single battery (at a reduced operating time) or operated without any batteries when connected to an external power source via the included USB cable for extended periods. The 240 BLITZ™ was Lightforce's first true long distance light and began their reputation for high performance and light intensity. It was not long before it became a favourite in the heavy transport, freight industry in Australia, Europe and Alaska. The combination of extreme light output, lack of vibration and durability made it standard equipment in many commercial fleets. If you desire long distance, power and value for money, the 240 BLITZ is certainly worth considering. The mid-size 170mm Striker out performs many larger lights and is one of our most popular models worldwide. Its compact size makes it an easy install on most vehicles and with a set of combo or spread filters it is incredibly versatile, creating an ideal peripheral light pattern. Many race vehicles are equipped with a set of Strikers for their fill type output complimenting either the larger Blitz / XGT or HID light for pure scorching distance. Clear Spot clip-on polycarbonate filter supplied. Others available. The new Enforcer 140mm LED handheld introduces Fresnel technology to the sporting market. The specially designed lens produces a tight beam for maximum light output and performance. The internal battery has a runtime of over 2-4 hours at full power depending on the model and you can even attach the clip on Enforcer battery to produce an extended runtime of up to 8 hours. Combined with a light weight ergonomic grip and an in built battery indicator the new LED Enforcer 140mm will provide the ultimate sporting experience. The 3W beam will give you a tighter beam pattern and the 10W will give you a broader beam pattern. Both styles of light are fully focusable. For users who want more flexibility and agility from their portable lights. Optional attachment for Enforcer LED, Halogen or variable power Enforcer. The high capacity Ni-MH battery converts Enforcer into a high power cordless search light. Supplied complete with AC mains charger 110-240 VAC. LiFePo4 Portable power packs, a third of the weight and twice the run time as sealed lead acid ordinary batteries. The battery with real work ethic! Presented as a complete kit with mains charger, bag, in built run time gauge and shoulder strap carry bag. Remote control handles are designed for mounting the SL or RM model lights through the roof of vehicles and boat bulkheads or incorporated into one of our remote roof mounting systems. They provide user comfort and superb control during operation from within the cabin. Installed as a permanent fixture through the cab of your hunting truck or mounted on removable brackets to your daily drive – Lightforce has a remote mounted system to match your needs. The modular system offers two handle lengths; four mounting options; and three sizes of lights with interchangeable coloured filter options. They provide user comfort and superb control during operation from within the cabin. The remote control is fitted with an on/off switch in the handle; variable tension adjustment can be selected from within the cabin to fix the light in one position or enable it to be freely rotated through 360 degrees. The only wiring required is to connect to your existing light. Coil cord with cigarette plug length is 2 metres fully extended 3.6 metres. Figure 8 cable with alligator clips is 4.5 metres. The Lightforce suction mount bar gives you the option to add a remote handle to the roof of your vehicle and remove it when needed. With the flick of the suction lever the suction caps secure to any clean flat surface. Pairing this up with our T-handles will give you the ideal setup for those nights on the hunt. With the Lightforce Support-a-Light you can mount your light in most window frames in seconds. This gives you the option to go out on your own and not need to hold a light and line up a target. Once you have finished with the mount, simply unclip it and stow it away until next time. compatible with the Lightforce Sporting range of halogen lights. Genuine Lightforce HID bulbs are uniquely optimised for Lightforce precision reflector systems. 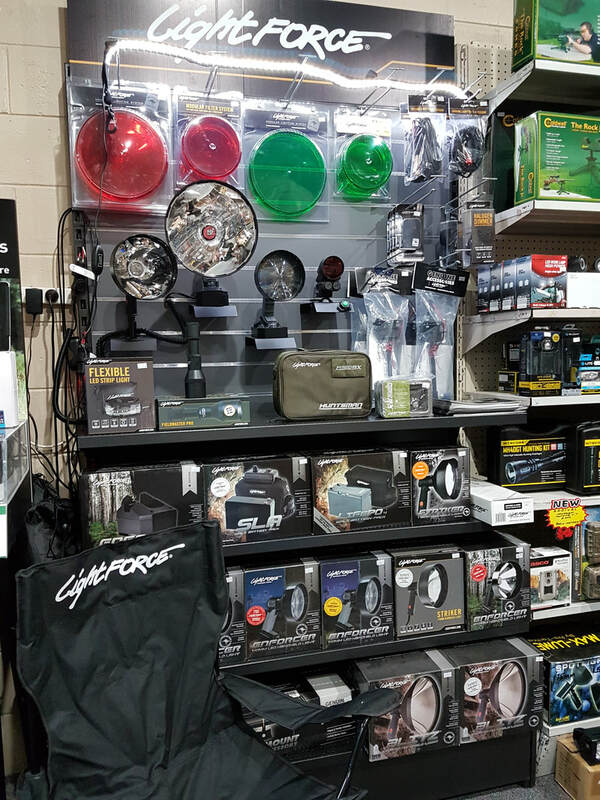 Keep your lights performing like new, always use genuine Lightforce HID bulbs. Halogen globes for sporting light applications. Vertical filament for tighter spot beam in sporting applications. ​The Fieldmaster Pro flashlight is versatile and rugged, designed and engineered to be used as both a handheld and firearms mounted light. This ultra-flexible, versatile 1200mm LED light is the perfect addition to your next outdoor adventure. Made up of 72 high intensity SMD5730 LEDs, it delivers more than enough light for most applications. Click on link lightforce.com to visit the Lightforce website to view their entire range.